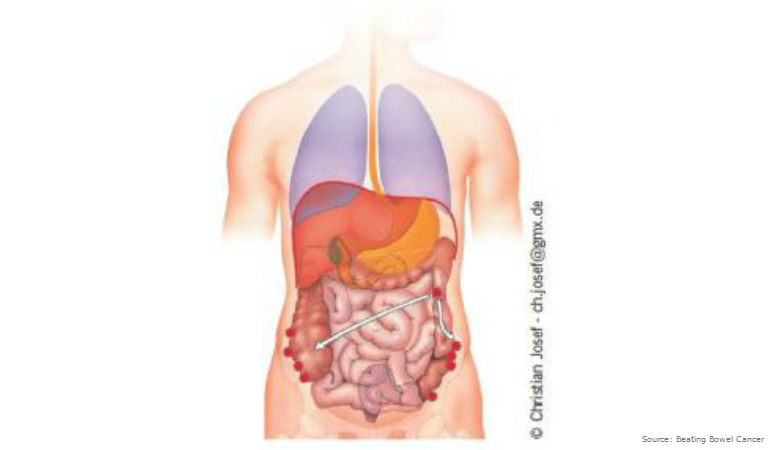 All the organs in the abdomen are contained inside a big sac or membrane called the peritoneum. Bowel cancer can spread through blood and lymph circulation, or it can spread directly inside this sac if a tumour grows through the bowel wall before it is diagnosed. Cancer cells can break off from the main tumour and escape into the abdomen, lodging between the lining (the peritoneum) and the other organs or tissues that are contained there. When this happens, they can either be reabsorbed into the lymph system, becoming caught up in the lymph nodes, or they can become embedded and start to grow on the outside of other organs in the abdomen or pelvis. The symptoms of local spread of bowel cancer can be vague, but are likely to include unexplained pain, tenderness over the area, or unusual discharges, changed appetite or unexpected weight loss. Bloating and weight gain can be caused by fluid collecting in the abdomen as a result of cancer cells that have spread there. Recurrent bowel cancer that has spread into the abdomen or pelvis is more likely to be diagnosed via your routine blood tests and CT scans, especially in the early days following your initial treatment. Investigations may include an ultrasound scan of the area, or an abdominal MRI scan or a PET scan. Abdominal (peritoneal) metastases can be more difficult to treat because of the way in which the cancer cells become attached to the outside of other organs and tissues in the abdomen. Treatment options available will depend on many factors, including which organs are involved and what other complicating factors might be present as a result of previous surgery (if this is recurrent disease). If there are just one or two isolated metastases in an easily accessible position, your oncology team is likely to ask a general surgeon with specialist experience and training to review your case and give an opinion on whether an operation to remove them might be successful. They may also ask other specialists to become involved if the metastases are affecting the bladder or kidneys for example, or the reproductive system in women (ovaries or uterus). When bowel cancer spreads to the lining surfaces of the abdominal (peritoneal) cavity, it can be more difficult to treat successfully with traditional chemotherapies. However, if there is no other evidence of spread outside the abdomen, then a novel treatment, called hyperthermic intraperitoneal chemotherapy (HIPEC), may become an option for some patients. The treatment is usually given during surgery when the surgeon will first remove all the visible cancer in the abdomen. While you are still under anaesthetic, this heated (hyperthermic) chemotherapy fluid is introduced directly into your abdomen (intraperitoneal), bathing all the organs and surfaces in the fluid for a maximum of two hours. The HIPEC procedure is designed to attempt to kill any remaining cancer cells that may be left behind, but that cannot be seen. This procedure is reserved for selected suitable patients.